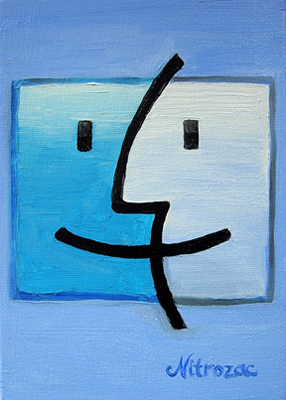 Finder, is the first icon in the Mac OSX Dock, therefore "Finder" is my first painting of the "Dock Series" of Nitrozac's Painting A Day Blog. The idea for the Dock Series is; the painting of the icon can stand alone nicely, or you can collect all of them and line them up to look like a Mac OSX Dock! That is very cool. Could you imagine how cool it would look with them on your cubical wall? People would come up and say "Wow! Finder! I just want to click on that, it's so cool!". Have you ever noticed how absolutely Picasso the Finder icon is? It's fun to stare at it and look at the face on the left, then the right, then as a single complete face, I could do that forever! I was very careful to highlight and shade the Finder to look exactly like it's sitting in the dock. Notice how it's painted lighter near the top? Painting in oils lends itself quite nicely to this type of blending, and the black edges came out quite sharp too! I'm very pleased with the result. The Finder icon is also the icon for Mac OS Classic, for those of you Classic fanatics out there (like me). Why settle for the Finder icon and it's clever beauty to grace only your desktop? Have it on your wall too. You'll be the talk of your Mac User Group with this lovely treasure! Just think, it's also infinite dpi, (I love that about paintings!). I hope the winner/buyer will get years and years of pleasure from owning this icon, or should I say, painting of an icon! Good Luck!